U.S. Seeing Lowest Level Of Unauthorized Immigrants In A Decade, Pew Study Says A large decline in illegal immigration from Mexico means fewer unauthorized immigrants living in the U.S., and those already here are likely to be long-term residents, according to a new study. 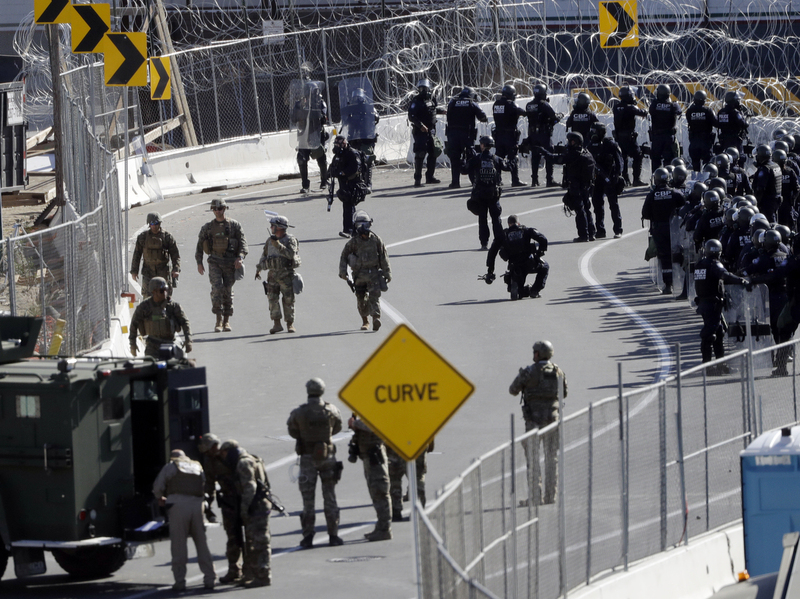 Military personnel and Customs and Border Protection officers gather at the San Ysidro Port of Entry in San Diego. The number of immigrants in the U.S. without legal status has declined to its lowest level in more than a decade, according to a new report released Tuesday. Amid the current headlines about migrant caravans and an "invasion" of unauthorized immigrants, the number of immigrants living in the U.S. illegally actually fell to its lowest level in more than a decade, a new study finds. The study, by the Pew Research Center, is based on 2016 government data. It estimates that there were 10.7 million unauthorized immigrants living in the U.S. that year. That's down from a high point of 12.2 million in 2007. The study's authors say the dramatic drop is "due almost entirely to a sharp decline in the number of Mexicans entering the country without authorization." Yet as illegal immigration from Mexico declines, the study says there is a growing number of unauthorized immigrants from Central America's "Northern Triangle" countries — El Salvador, Guatemala and Honduras. The number of unauthorized immigrants from Central America increased by 375,000 between 2007 and 2016, to a total of 1.85 million people, says the study. The report comes after a far greater estimate of the number of unauthorized immigrants was made by researchers at Yale University in September. That study found that there are 22 million unauthorized immigrants, or more than twice as many as estimated by Pew. Mark Lopez, Pew Research Center's director of global migration and demography, declined to comment on the Yale findings except to say that his group relies on research methods used by the Department of Homeland Security as well as nongovernmental organizations such as the Center for Migration Studies and the Migration Policy Institute, whose estimates generally align with Pew's findings. The Pew study finds not only a decline in the total number of unauthorized immigrants but also fewer recent arrivals. The study defines a "recent arrival" as someone who came to live in this country in the past five years. In 2007, 32 percent of all unauthorized immigrants were recent arrivals. In 2016, only 20 percent had arrived in the previous five years. "As their typical span of U.S. residence has grown, a rising share of unauthorized immigrant adults—43 percent in 2016 compared with 32 percent in 2007—live in households with U.S.-born children." The study estimates that 5 million U.S.-born children live with unauthorized immigrant parents in what sociologists and demographers refer to as "mixed-status households." A rising share of unauthorized immigrants arrive legally, but overstay their visas, according to Pew. "There is growing evidence about immigrants with expired visas from recent analyses by the U.S. Department of Homeland Security, which has produced three annual reports since 2016 analyzing statistics on the origins of immigrants who overstay and the types of visas they held. The latest report, for the 2017 fiscal year, estimated that more than 700,000 overstays should have left sometime during the year ending Sept. 30, 2017." "Not only is the unauthorized immigrant population smaller than a decade ago, it also includes a different mix of people — fewer Mexicans, fewer workers, more Central Americans," said Lopez.